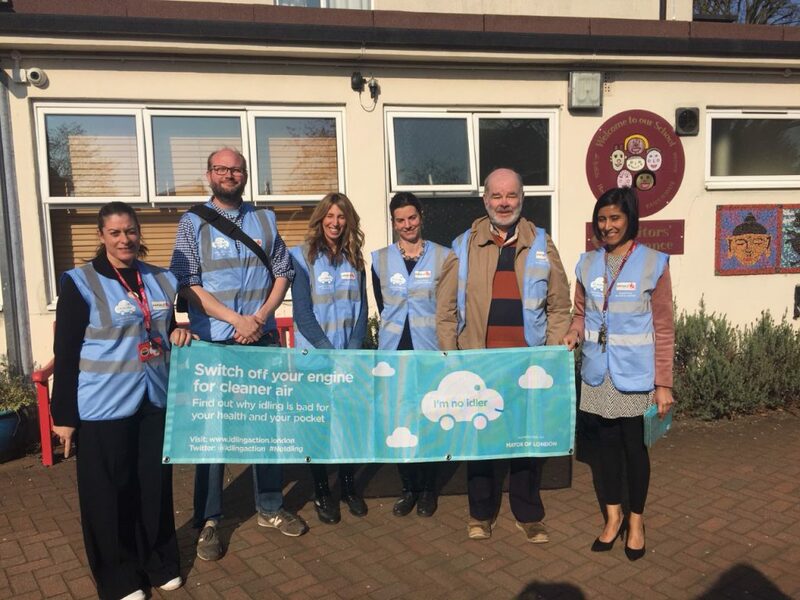 There were two events to promote cleaner air at Enfield schools last week – one at George Spicer Primary on Southbury Road and the other at Walker Primary School on Waterfall Road, N14. I was at the Walker School event -and it was a real eye opener. The event kicked off with an assembly led by Jamie from Idling Action on air pollution. The children were very switched on and knew all the answers about the millions of vehicles on our roads causing air pollution, including cars on the school run. Walker School does an excellent job of promoting active travel to school – and we were at the end of the Big Pedal week, with record numbers of kids walking, scooting and cycling in. But they have a big challenge on their hands, as we were about to find out. 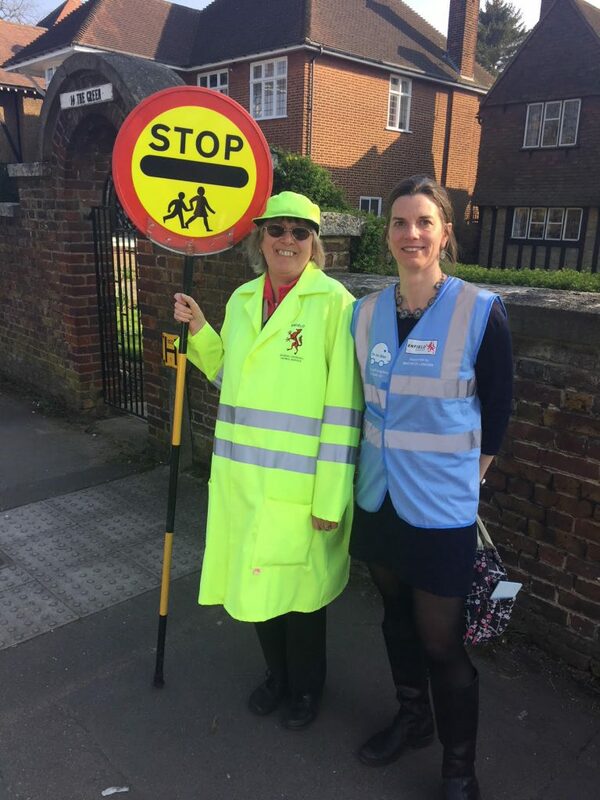 On the street (we were there to talk to parents idling their engines, but found none) we witnessed Rose the Lollipop Lady doing a great job of getting families safely over a faded zebra crossing on hostile Waterfall Road. We were shocked to find out that Enfield crossing patrol staff are losing their jobs, including Rose, at the end of this school year. A parent has launched a petition to try to change the council’s mind – you can sign it here. Rose’s job is absolutely vital. We witnessed an incredible volume of traffic surging up Waterfall Road from 3.30pm onwards. Rose told us that drivers often come up the hill too fast, and the week before one driver had actually hit a child on the zebra crossing. Fortunately the child was unhurt, but it’s an indication of the level of traffic and danger that families face every day when they dare to do the school run without a car. Why is this school street so busy? Waterfall Road is already a heavily used through route for drivers avoiding the North Circular. There was also a lot of school run traffic on its way to schools and nurseries in Southgate. Plus, despite the school’s brilliant efforts to encourage active travel, a huge number of parents drive to Walker School itself. We saw parents’ cars fill the two car parks on either side of the school at pick-up time – despite the school having an official catchment of 0.3 miles. Some parents are no doubt driving very short distances to school, perhaps to then drive on somewhere else. But the school staff told us that many families live as far away as Potter Bar – some of whom rented flats temporarily within the catchment just to get into the school. The result is traffic-heavy streets where families don’t feel safe on foot, never mind on bikes. Some parents probably drive to school because it feels like the safest way to transport their kids. And so there is more traffic, more air pollution, more danger, less exercise, and everyone suffers. The council is proposing a raised table for the zebra crossing and a 20mph limit on Waterfall Road (possibly just at school run hours). While those changes could help a little, the problem is very entrenched. Like Waltham Forest, we could reduce demand for driving short trips by closing networks of rat runs to cars (and opening them to all-age walking and cycling). Our proposal for the Fox Lane area would make The Mall and other rat runs safe enough for children to walk or cycle to school. Less – or no – free parking on Waterfall Road would also encourage parents to reconsider driving the school run. The area is, after all, very well served by buses. We could have 20mph limits covering most of the borough, not just one street at certain times. We could have more zebra crossings where people want to cross busy roads, giving more priority to pedestrians over cars. We could keep building safe space for cycling, allowing even primary school kids to cycle separated from motor traffic. These are the kinds of measures that bring about behaviour change, and eventually a culture change, that will make our streets safer for families doing a car-free school run.